This is our third weekend exploring John, Chapter Six. Two weeks ago we read about the Loaves and the Fishes and last week we read another portion of the Bread of Life discourse. This weekend we continue where Jesus left off last week. 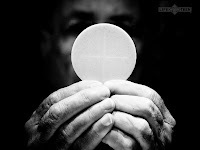 At the end of last weeks reading, Jesus says, "I am the bread of life; whoever comes to me will never hunger,and whoever believes in me will never thirst." The Jews, who must have had the same mentality as cops because they are always skeptical, started talking amongst themselves saying, "Whatever--This is Jesus. We grew up with him. We know his mom and dad. He didn't come down from Heaven. He must be smoking something." Never mind the fact that he just multiplied the fishes and loaves. will give is my flesh for the life of the world." I gave the rest of the reading because I didn't want to take things out of context but three lines there strike me. The first is "whoever believes has eternal life." The second is "whoever eats this bread will live forever." Finally, "the bread that I will give is my flesh." As Catholics we believe in the "real presence." We believe that during mass that the bread and wine is consecrated and changed into the body, blood, soul, and divinity of our Lord, Jesus Christ. Several years ago, there was a statistic going around that only a third of Catholics believe in the true presence. This stat came from a confusing survey asking people to pick between several confusing theological definitions. It would have been better served as a question on a theology students test. Recent studies have shown that the statistic is closer to 81%. It's still sad that there are 19% of catholics who don't believe what has been described as the "source and the summit" of our faith. I find a more shocking statistic is that less than half of catholics attend mass on a regular basis. That means there are nearly a third of catholics who DO believe in the real presence but don't come to mass regularly. How can you explain understanding that you will be in the physical presence of Jesus--in the physical presence of GOD and not go there regularly?? At least the 19% who don't get it don't understand what they have. You do!! If we truly believe in the True Presence, there should be no question about whether going to Mass is a priority. We should be lining up outside the doors and around the block! To be able to partake of Eucharist is such an intimate and precious moment! I did a paper in college on the attendance of practicing catholics, and across the US, it was around 32%, and in California (where I live), only 25% of baptized Catholics attend mass. Coupled with your statistic that over 80% of Catholics DO believe in the real presence... no excuse!